For a visit to one of the world’s most pristine jungles that is both interactive and highly educational, a visit to the Manu Learning Center, a functioning research center and guest lodge, is an absolute must! 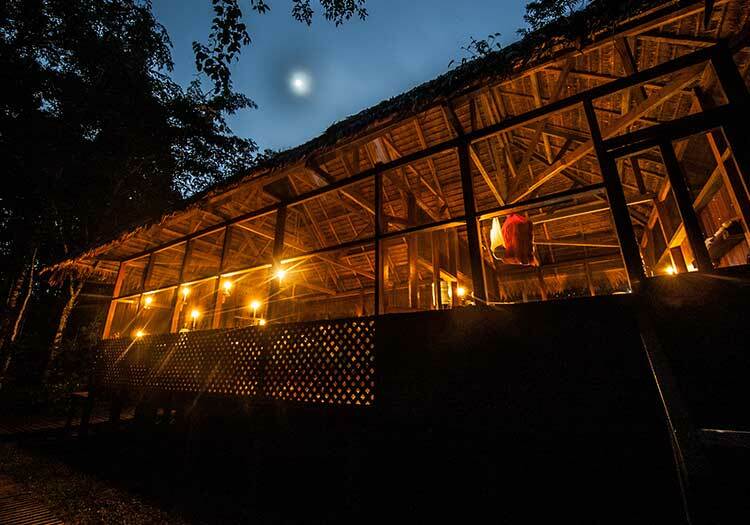 Situated deep in the heart of the Manu Biosphere Reserve, the Manu Learning Center by Crees is the optimal location from which to begin an educational and hands-on Peruvian jungle adventure. With six guest commodes, each with native roof thatching, the Manu Learning Center provides comfortable lodging, delicious food, an informative guest library, and a hammock area protected by mosquito netting that is the perfect retreat after a long day exploring the jungle. Devoted to protecting the fragile and incredibly diverse environment by which the lodge is surrounded, the Manu Learning Center takes great care of its nearby jungle and also provides wifi – powered by renewable solar power and a true rarity in these parts!